Of course the one thing you don’t want to miss is our Oahu zipline tour! We’ll let you experience the longest ziplines in Oahu, offering panoramic views of the North Shore’s famous beaches, lush mountains, and farms. Along the tour, you’ll learn about Hawaii history, culture, and farming and see how Hawaii has changed throughout the years. You’ll even have the opportunity to explore Keana Farms and taste some of the fresh fruit produced there. Our zipline tour includes 8 side-by-side zipline runs, an ATV ride, scenic boardwalks, rappels, and more. The Polynesian Cultural Center is the place to visit for those who want to learn more about the heritage of the Pacific Islands. The cultural center allows visitors to explore authentic villages and talk to natives from 6 different Pacific cultures. And you don’t want to miss the evening show, Ha Breath of Life, which features more than 100 Polynesian natives, special effects, animation, and surround sound. There are also plenty of opportunities for shopping and dining at the Polynesian Cultural Center. For another great way to see the sights, take a helicopter tour! There are a variety of tours to choose from, but one of the best is the Oahu Sunset Experience. This tour departs from the Kalaeloa Airport and takes you on a full-circle tour of Oahu, Hawaii. Some highlights of the helicopter tour include Hanauma Bay, Makapu’u Lighthouse, and Ka’a’awa Valley. At Pounders Restaurant, enjoy a new and delicious presentation of island-style dining that combines authentic Hawaiian recipes with the flavors of modern cuisine. The restaurant serves farm-to-table produce, organic beef raised in Hawaii, and seafood caught in nearby waters. Favorites on the menu include Pounders Fresh Poke, Mahi’mahi Nuggets, and the Hukalau Sandwich. While you’re at the Polynesian Cultural Center, be sure to grab a bite to eat! This attraction offers a variety of delicious buffets for you to enjoy. For lunch, try the BBQ Buffet that’s a big hit with visitors. 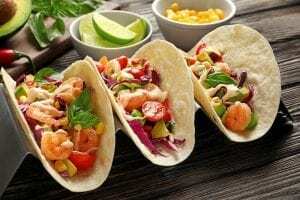 This buffet includes entrees like grilled boneless chicken and vegetable and shrimp stir-fry. For dinner, try the Island Buffet, which is served in a spacious dining hall and includes authentic dishes like Kalua pork and herb and panko crusted island fish with lemon butter sauce. CLIMB Works Keana Farms offers a 3-hour guided zipline tour that lets visitors explore the beauty of Oahu and learn about Hawaiian history and culture. Our mission is to get people out of their comfort zones in a safe and controlled environment. We combine adventure and nature in our zipline tour and help you overcome any fears. 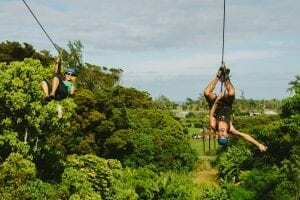 A great vacation in Oahu starts with a zipline tour with us at CLIMB Works! Learn more about our ziplines in Oahu, and start planning your trip today.